When attending a wedding in Korea, it is customary to prepare/give money as gift. This is called “congratulatory money” (축의금). Usually, such money is prepared in advance by inserting the bill(s) into an envelope (like my envelopes above). On the back, one writes one’s name. 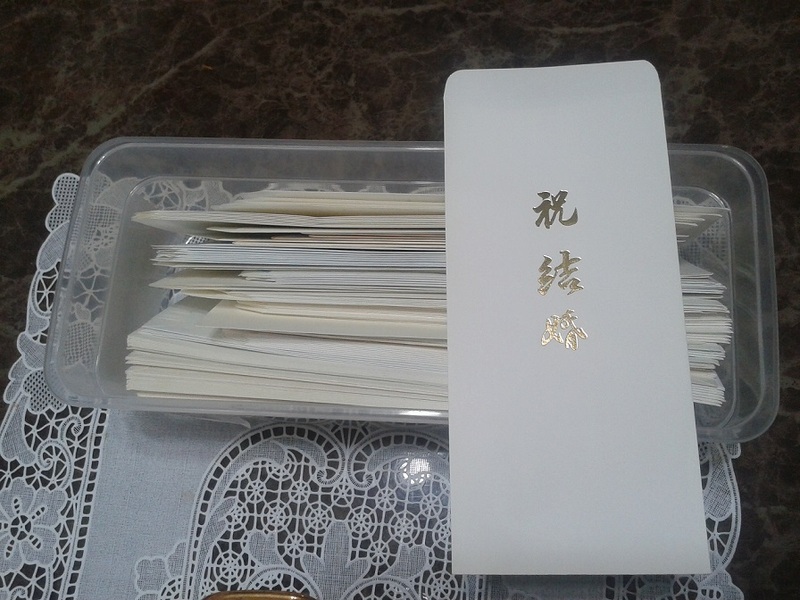 Such envelopes are normally available at the wedding too. Below are three (Korean law) tidbits about congratulatory money in Korean weddings. Let us say, a Seoul civil servant (whose daughter is getting married) sends out text message e-vites to 45 civilian contractors he is (or will be) in charge of supervising/overseeing officially. Even though none of the 45 personally know or is acquainted with the civil servant, they all show up (probably fearing penalty/disadvantage) and each give from KRW 50,000 to KRW 300,000 (USD 47-280) in congratulatory money. According to the Supreme Court of Korea, these would all constitute “bribes” (뇌물). By (knowingly) accepting such money, the civil servant will have committed the crime of “Acceptance of Bribe” (뇌물수수) under the Criminal Act (형법). The Court ruled that any amount of such money received by such a civil servant could constitute a bribe if it cannot be proven, the existence of “acquaintance” (친분). The lack of such “acquaintance” proves the existence of “consideration” (대가성), an element of this crime. Please refer to the Supreme Court Decision of December 16, 2013, 2013Do7871. By default, Korean courts tend to see such congratulatory money as belonging to the parents’ of the bride/groom. In Korea, many guest are invited and come as a guest of the parents. The courts seem to view the money as being given to the parents directly. Should the parents decide to give such money to the bride/groom, the money will be deemed a “gift” (증여) and be taxed under “gift tax.” For instance, if KRW 200,000,000 was collected and given to the bride/groom, the bride/groom would have to pay more than 50,000,000 as gift tax. (In Korea, the donee pays the gift tax.) In order to avoid paying such tax, the bride/groom must actively prove the money was given by their acquaintances (not their parents’). This is one reason why guests write down their names on the envelope + the guestbook. Crashing a wedding in the form of stealing congratulatory money is, of course, a crime. The crime could be “Larceny” (절도), “Special Larceny” (특수절도), “Fraud” (사기), etc. It would depend on exactly how, and by how many the crime was committed. A perpetrator could surreptitiously “intercept” the money by pretending to be in charge, in the midst of chaos (above video). My policy with regard to attending weddings is simple. I try to goto weddings that I am personally invited to (e-vite or invite). I normally do not goto weddings that I am invited en masse. I do not “relish” going to weddings. I like to rest/relax (on weekends). FYI, it is not uncommon to wire congratulatory money (to an account) if one is unable to attend. One could also ask a person who is attending to give on his/her behalf. Some Korean weddings now choose not to accept any congratulatory money. After all, giving and receiving such money is not mandatory. Below is an interesting segment from the Korean comedy TV show Gag Concert. In a segment called “Man Who Answers Iffy Questions,” the comedian explains to the viewers what (he thinks) should be the policy. He measures “closeness” by seeing if the parents know his name at the wedding. He suggests saying hello to the parents (first) to see if they call you by your name. 1. I have seen quite a few people be hurt or disappointed when the bride/groom (later) fails to say any thanks for their having attended the wedding. I am personally okay with such an oversight, but I do think it’s nice to be thanked. One of the worst situations could be when a person gives a lot of congratulatory money, yet he/she never really hears from the couple again.